Powers/Abilities: Riot-Act's full superhuman abilities have not been revealed. She was able to fly under her own power. Though agile, she was by no means invulnerable. Preferring a rather extreme appearance, with piercings, facial tattoos and a shaved head, Riot-Act also cursed like a pirate with stage IV Tourette's syndrome. 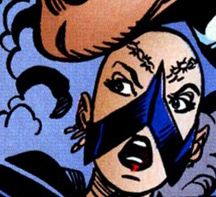 (Marvel: The Lost Generation I#12 (fb) - BTS) - The rebellious woman calling herself Riot-Act became associated with the First Line at some unrevealed point in time, possibly the late 1980s. (Marvel: The Lost Generation I#12 - BTS) - When the First Line learned of an impending Skrull invasion, they assembled their entire roster and all their friends and associates, among them Riot-Act. The group of heroes went into space to combat the aliens head on. (Marvel: The Lost Generation I#12) - The First Line proved no match for the Skrull forces, as the heroes slowly but surely started losing despite their best efforts. Incensed and outraged to see so many fellow humans fall, Riot-Act cursed out the Skrulls while dodging their fire in midair. 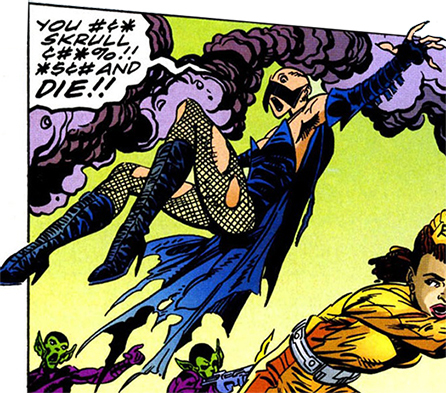 First Liner Flatiron interrupted her tirade to remind Riot-Act she couldn't actually curse their enemies to death. Before the words left his mouth, the Skrulls overloaded his battle armor, causing it to detonate, killing him, Riot-Act and the attacking aliens in the process. Their demise was witnessed by the time traveling historian Cassandra Locke who was on the scene as well, trying to avoid getting hit. Very little has been revealed about Riot-Act, though her demeanor suggests she was by no means always on the side of the angels. For my money, she's actually (former) First Liner Rebound who went through a Storm-like rebellious phase in the early 1980s. But instead of getting a Mohawk and a black leather jacket like the windrider, she opted for a slightly more provoking outfit and vocabulary. It would certainly explain the unusual facial mask she chose to wear. As the head writer of the Official Handbook of the Marvel Universe at that time, I can tell you, the official policy is: Frank of the First Line is apparently either a Frankenstein monster - meaning a creature created in the manner of Victor Frankenstein's first creation - or just a being with a similar appearance and abilities who adopted the name Frank due to the notable similarities. However, it as yet remains unrevealed whether Frank is actually the original creation of Victor Frankenstein, aka "the Frankenstein monster." Previous entries referencing Frank as "Frankenstein monster" were unclear in specifying/clarifying this point.